Home	- Arcade & Amusement Industry News	- Farogames to Display Thunderbirds Pinball at Enada Primavera 2019! Farogames to Display Thunderbirds Pinball at Enada Primavera 2019! Thunderbirds Pinball agent, Farogames, will be displaying Thunderbirds Pinball at Enada Primavera 2019 in Rimini. 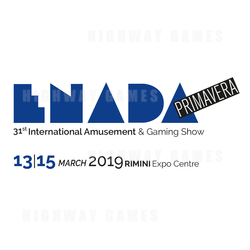 Organised by the Italian Exhibition Group (IEG) and promoted by SAPAR, Enada Primavera is one of the most important exhibitions in Southern Europe dedicated to the gaming sector. Enada Primavera is an unmissable event for the whole sector as it is a fundamental occasion for business, exchange, getting up to date and innovation. It is being attended by more than 25,000 professional visitors, confirming its role as a leading expo. It also represents a reference point for gaming trade members' businesses and an opportunity for networking and discussion that should not be missed. You can check out more on the exhibition here.